The narrative designers at Ubisoft have their work cut out with Assassin’s Creed Odyssey. Not only must they craft a story that remains engaging during its many hours – hours that will be more plentiful than its Egyptian predecessor, Origins – but they must do so with player choice and romance options thrown in for good measure. Now, in my Gamescom hands on, I can’t exactly assess whether Ubisoft has succeeded – not yet – but I’m certainly impressed with what I’ve seen. My demo starts innocuously enough: I’m to rescue a woman from a group of harassers. This battle leads into an island-hopping quest as epic in scope and scale as any Assassin’s Creed adventure I can remember. I must sail my boat, willed on by my crew as they yell out a good sea shanty, search for clues, and of course, assassinate my fair share of bad guys. The islands I visit feature the same filler tasks – find X treasures, kill the commander, you know the stuff – but you can choose to ignore them. The woman I rescued ultimately leads me into a foreboding forest, down a path flanked by human statues frozen in fear, petrified in both senses of the word. It doesn’t take an encyclopedic knowledge of Greek mythology to realise that a snake-haired gorgon is likely waiting for me at the end of this woodland trail. 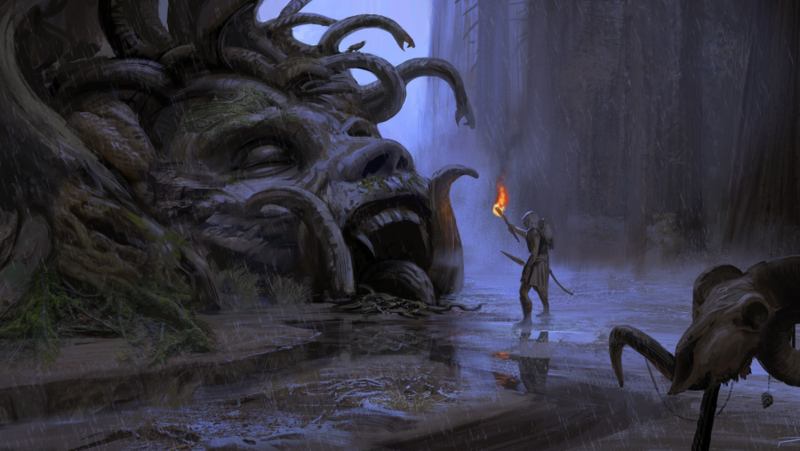 I find Medusa snaking around in a wide circular arena, the open ground broken up by tall pillars. 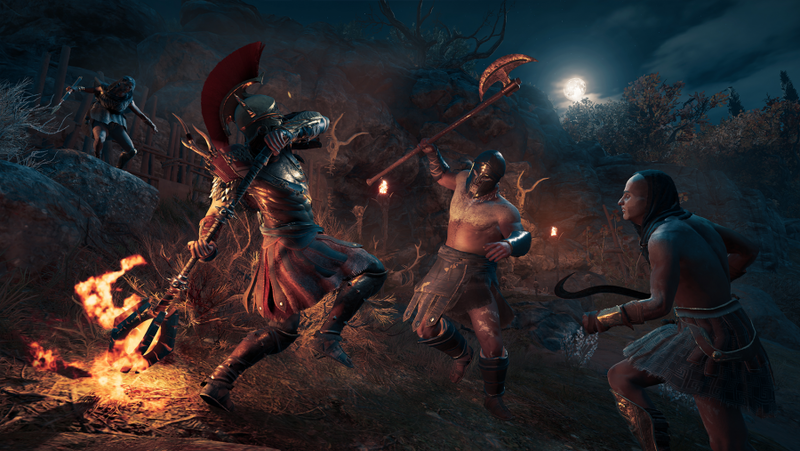 Unlike Perseus, who faced the gorgon with a mirrored shield, reflecting her gaze, I must face her without such aid – Ubisoft doesn’t let you cower behind a shield in Assassin’s Creed Odyssey, instead you must block with your weapon. You can parry with the left bumper (my hands-on was with an Xbox One X), blocking attacks and opening up enemies to counters. The pillars do little to cover me from Medusa’s searing sight. She attacks with a wide sweeping beam that cuts deep every time she hits me, which happens frequently, as I mistime my dodges. My poor timing is further punished as attacks rain down from the sky like mortar fire. Through the d-pad and bumper I can get a quick hit of health and ignite my blade but I still stand frozen to the spot. I actually have to think about what I’m doing now. Long gone are the days when I merely wait for an attack animation and effortlessly counter, as I did before Origins. And all this is only a side-quest. Too often in Origins a side-quest would constitute a pinch of exposition from a distressed NPC that sends me on a path to clear out a camp or towards a question mark on the map. If this quest is telling then Odyssey’s peripheral missions are far richer. This is by no means the first time an Assassin’s Creed game has been compared to The Witcher 3: Wild Hunt – Matt made similar comparisons between Origins and CD Projekt’s fantasy masterpiece last year – but, if you’re going to be inspired by anyone, you could do worse.